I have always loved and admired shoes but as a petite, I have always had such a hard time finding the right fit! This always left me feeling frustrated and mostly, empty-handed, as I left stores. I've never bought a pair of shoes online because of this dilemma. If you have a hard-to-find size, you know what I'm talking about. For many years, I bought shoes thinking they fit well, only to discover they were uncomfortable and too big for me once I got home. The reason for this? Well, I used to try on shoes, stand up, take a look at the reflection in those tiny mirrors they have in stores (come on, can we get some nicer mirrors in there?!) decide it was good enough and walk out with them. Once I'd actually be wearing them with my outfit, I'd realize they were too big and made my feet ache and/or blister. I also tried all of those hacks they have, insoles, inserts, etc...but nothing was really quite working. Those who know me, know I like to do my research so I began researching stores that sold great quality shoes and that carried an array of sizes. And what better shoe to begin my search with than the classic pump; thus my search began. I'm not going to lie to you, when I was looking, my focus was on size and fit - I wasn't even prioritizing comfort! After months of searching, I have finally found my perfect match. When my eyes landed on a pair of grey, leather pumps from Cole Haan, I knew I had to try them on. The moment I tried them on, I knew that they were the most comfortable high heels I've ever tried on. Even as I tried different brands that same day, the comfort was unlike any other high heeled shoe I had ever worn. After years of being skeptical though, I left the store without buying them because I thought, it can't be! I returned a few days later though and I had the same experience; this time, they came home with me! 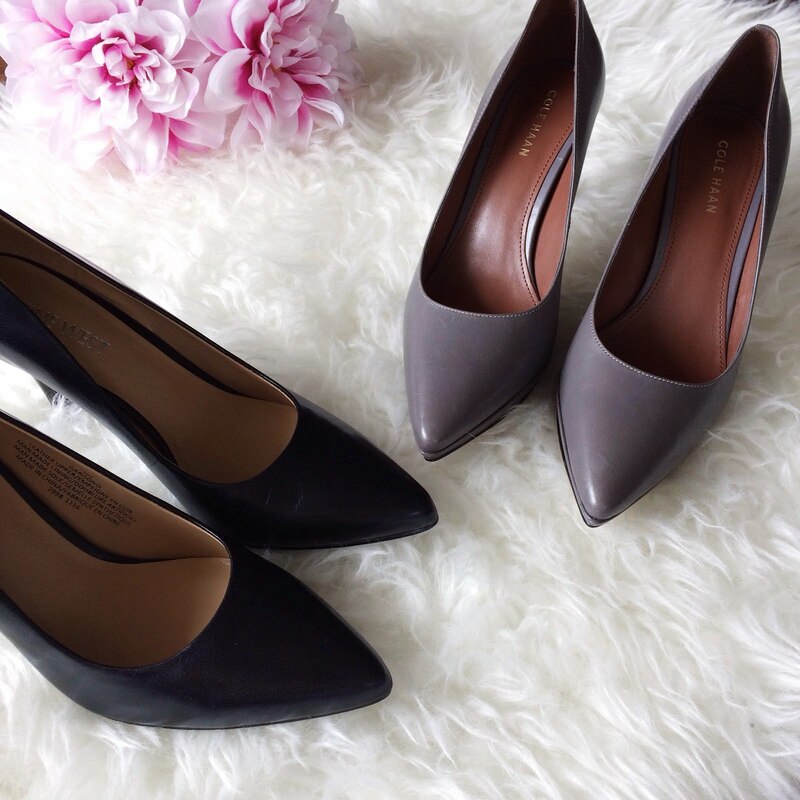 Cole Haan currently carries two heights under their "heels" category: high (3-4 inches) and medium (2-3 inches) and they carry sizes 5-11. Some selections are also offered in wider widths. The Eliza Grand Pumps have achilles padding and a flex-molded leather outsole that creates that broken-in comfort that you feel. 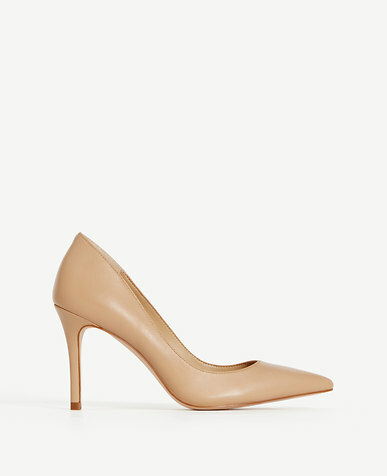 These are definitely great if you are looking for a heel that will take you through the 9-5 day at the office or if you are running through the streets of NYC like Carrie Bradshaw. 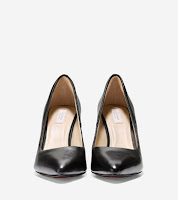 Also for petites...Nine West offers smaller sizes, beginning at size 5. Another great place to shop for classic pumps is Ann Taylor. They carry sizes 6 and up in their stores but carry size 5 and up online. I have linked a few of my current favourites below. 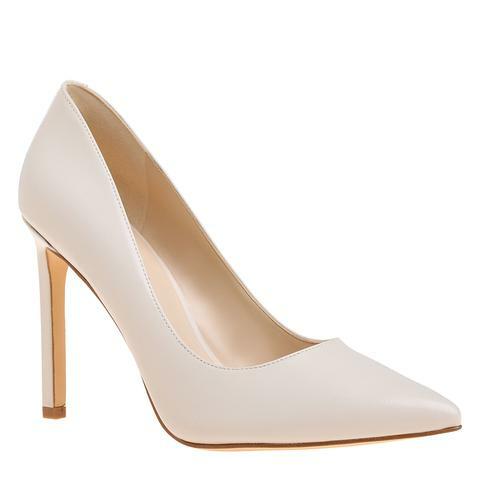 What are your favourite pumps? Do you ever buy shoes online? What are your go-to stores for shoes?